May all the outdoor kitties, especially the black ones, be safe tonight. Halloween night is one of the nights of the year when I really worry about Oliver and his family. It's not a good night to be a free roaming black cat. I've given Oliver special instruction to watch over his family this night and to do all he can to keep them safe. No kitty should be out wandering around tonight - it's too spooky out there and too many goblins to get you. Stay safe pal. We agree--Oliver and his family should hunker down in your backyard until it's all over! I'm always secured safe and sound inside at night. Plus, we live so far out and behind a locked gate. No bad people can get near me! An extra prayer for them. I am sure they will be safe with you! Happy Halloween,. I too hope Oliver and his family stay safe..
Can't you keep Oliver inside? Keep a good watch over him Cat Guy. And his family. as long as they stay close by, they will be safe. 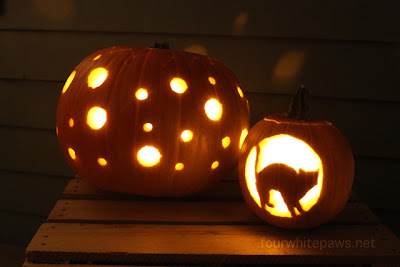 On another note, I LOVE YOUR PUMPKINS! They look great. Happy Halloween to all at The Four White Paws. Keep my paws crossed for Oliver and his family to be safe ! Hoping all is well for Oliver and family! Mr Toes is inside safe from all harm tonight! I am so glad we rescued him. He and Charlie are still living in different parts of the house right now but we are hoping with time they will integrate. I think it will help when I'm home, right now the Mr is doing all the cat chores and playing while I'm gone. We hope Oliver and family are ok! Thanks for the important post! We're purring that Oliver and family stay safe!